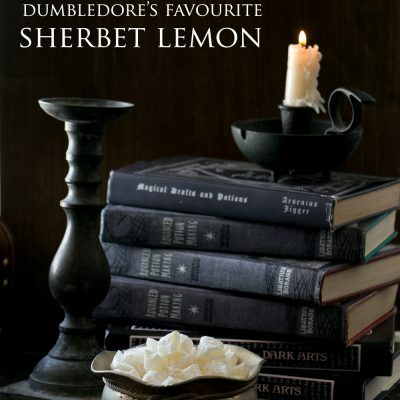 Even if all other food (butterbeer exempt) escaped your notice in the whole Harry Potter series, who can forget Dumbledore offering Professor McGonagall a sherbet lemon while they waited for Hagrid to deliver Harry to the Dursleys? Since that first chapter, we’ve been swept away in a magical world for the past 20 years, one that any Harry Potter fan will tell you, you never quite leave. It seemed only right that we start our 20-day celebration of Harry Potter with this first humble sweet. Sherbet lemon is one of those foods where the name was changed between the UK and American books– in the UK books this treat is called sherbet lemon, and in the US versions, lemon drops. 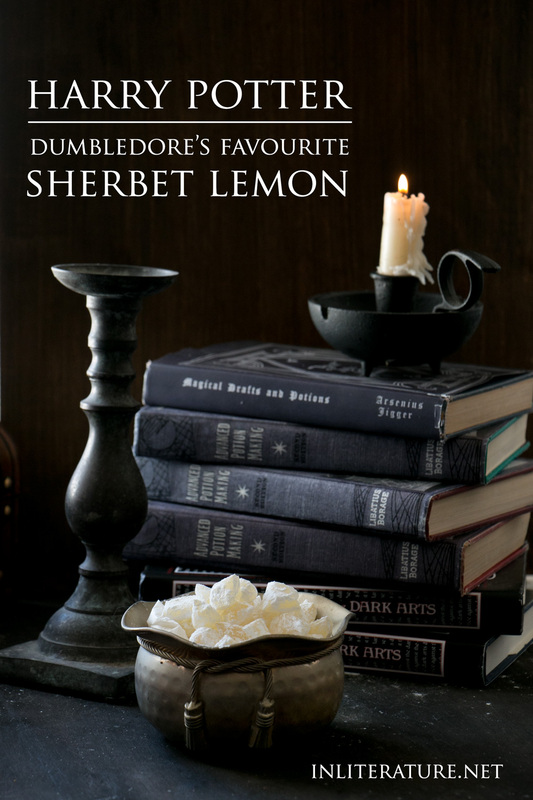 Whatever you call them, these hard candies are filled with a fizzy lemon powder (sherbet), and are a favourite of Dumbledore. 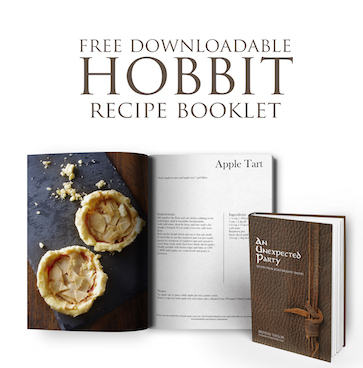 In a saucepan, stir together over medium heat, the sugar, water, glucose syrup, lemon peel, and cream of tartar. Once the sugar has dissolved, place in the thermometer and let cook without stirring. While it's cooking, in a bowl mix together the icing sugar, citric acid and bicarb soda, and set aside. Have a pat of butter nearby, to keep the end of the chopstick oiled. Once the candy reaches 300F, hold the metal strainer over the silicone mat and pour the candy through to catch the lemon peel. Put on your candy making gloves, and start pulling and tucking your sugar edges into the middle, until the whole piece can be picked up. Start pulling and folding the candy over and over until it starts to become difficult. Pull sections off, rolling the pieces into balls, then pressing the chopstick end down into the middle of the candy, before removing the chopstick to leave an insert where the powdered sugar can go. Once all the balls with holes have been made, press, using a clean chopstick, the icing powder mix into the centre. Assuming the candy is now too hard to press together, place the candies on a baking tray lined with baking paper, and place in a warm oven. Pay close attention using your gloved hands to check for softness. The moment you can press the ends together of one candy, remove the tray and close all the ends. Don't let the candy heat up too much! In a bowl, mix together a cup of icing sugar with a tsp of citric acid, and roll the candies in the powder. I prefer to store my candies in the excess sugar in an air tight container to keep any moisture at bay.